While black caviar may have the higher price tag, Russia red caviar is still a savored delicacy. Red caviar, a famous Russian delicacy, appeared on the tables in Russia rather recently, around the same time as potatoes in the 18th century. However, Russians have always liked fish and seafood, unlike potatoes. With the final annexation of the Far Eastern regions to the Russian Empire, her subjects gladly took a fancy to a new appetizer from there, which started to be supplied to the European part of the country by tens of thousands of tons. Various species of salmon have always been common in reservoirs in the north of the European part of the country, and, of course, red caviar was well known and regularly consumed. However, the extent of its consumption was much lower than that of the famous Russian black caviar, without which no reception was held in those days – from parties within the family circle to large banquets. Coho salmon, also known as silver salmon or white fish and named for the bright silver color of its scales, provides the most expensive caviar. It is considered as the best, and its color is bright red. Coho salmon is a fish that is also known in America (it is found also in Alaska) and is not bred in captivity, because Coho salmon die after spawning. Kryazhevaya lake char is a legendary fish. A man who has fished for lake char is considered a master among fishermen. Lake char live in deep Ladozhskoye and Onezhskoye Lakes in the European north of Russia, it is a very timid fish and lives at depths of 70 meters to 150 meters, never rising higher. It seems funny, but the gastronomic qualities of Kryazhevaya trout are not high: its flesh is a bit loose, in comparison with other salmon, and its caviar is pale yellow. Chum salmon – the greatest mass supplier of caviar – is strikingly different from char. Sometimes when this fish comes from the Pacific Ocean to spawn in the rivers of the Kamchatka Peninsula and Sakhalin Island, the water is hardly visible due to its huge numbers. In some places, the natives still go fishing with a bucket or simply pull out the fish with their hands – as much as they need. It is clear that in these regions, red caviar is not quite the delicacy that it becomes after traveling thousands of kilometers to the west. Technology of caviar production is rather simple: fish eggs are released from membranes. In factories special sieves are used, in private life a simple fork can be used, and then are covered with unrefined salt or specially brewed brine is poured over them. Nutritionists highly recommend this dish: you can take capsules with polyunsaturated fatty acids (omega 3, 6 and 9) for months, for successful prevention of heart disease, or you can eat three small sandwiches with red caviar every day, which is much nicer. 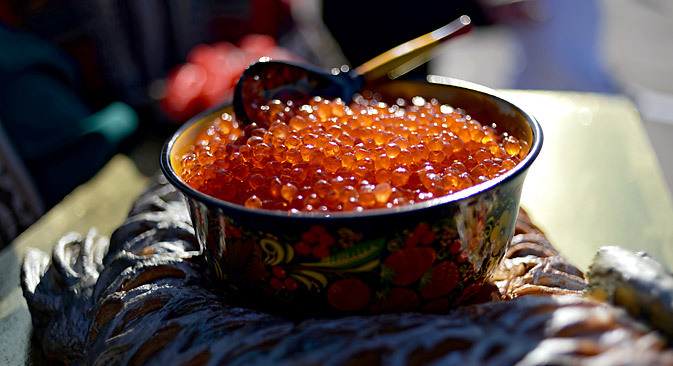 Now red caviar is as common on the Russian table as black caviar used to be in the past. It is usually served on toasted dark bread, preferably Borodinsky, with fresh sweet butter, sprinkled with lemon juice and garnished with a sprig of dill or half a black olive. However, dill is not necessary, the more so in the West, as this vegetable herb is considered too strong for them, which is in contrast to the Russians, who strive to put dill into every dish. Chicken or quail eggs are often stuffed with red caviar. Icy vodka is considered the traditional accompaniment to caviar, but dry white wine such as Chablis and Champagne Brut is also quite appropriate. If you go to Russia, be sure to buy caviar in any city you visit. It is not too expensive – a can of 150 grams will cost you $10 to $15. You only need to remember two things: always buy caviar from the current season, and that produced on Kamchatka or Sakhalin – this is a guarantee of quality.